A long torturous (but scenic) drive throughthe middle reaches of the Blue Mountains yielded to the lovely Forres Park hostel, complete with own coffee farm. Jamaica to the US east coast, where she is a relative unknown. 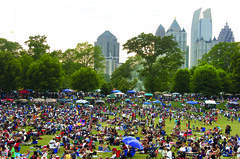 genres ranging from pop and jazz to reggae and R&B. the Red Bank Family Support Center. and Development Initiative are jointly sponsoring this year's concert. Showtime for the Aug. 1 event is 7 p.m.
Jamaican jazz pianist Dr. Kathy Brown is a big hit on a world leading Internet jazz website. 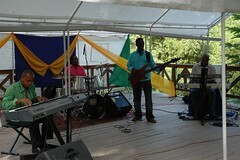 The founder and leader of the Dr. Kathy Brown & Friends band reached position No. 82 of the Top 200 most viewed musician profile on arguably the world best media reference in jazz and improvised music. Within a mere one month of being posted on AllAboutJazz.com, the Jamaican pianist tallied 470 hits to move up the Top 100 of thousands of registered musicians whose profile appear in the New York based jazz publication. The All About Jazz (AAJ) tabloid and Internet magazine, which, at the time of writing, has on register 13,790 jazz musicians, records an average of 1 million Internet viewers per month from across the world since 2006, recording a phenomenal 47,151 hits on January 15 this year. Of the Top 200 Musician Profiles Viewed, Kathy Brown appears four positions behind her mentor Ahmad Jamal (78) six behind Ella Fitzgerald (76), two and four places before pianist Herbie Hancock (84) and trumpeter Chet Baker (86) respectively. A sample of names appearing before Brown include singers Sarah Vaughn (72), Ray Charles (67), and Michael Buble (68) saxophonist Kenny Garrett (58), band leader Duke Ellington (50), John Coltrane (36) Louis Armstrong (27), Wynton Marsalis (21), Thelonious Monk (8), and master trumpeter Miles Davis (4). Some well-known names in jazz and improvised music, a few superstars included, are yet to garner the kind of curiosity that Kathy Brown offers as a fresh new artist on All About Jazz. She is currently ahead of Clifford Brown (97), Oscar Peterson (99), Sonny Rollins (102), pianist, and singer Diana Krall (103), Chuck Mangione (122), Joe Sample (131), Dexter Gordon (142), Quincy Jones (143), Billy Holiday (146), the instrumental band Spyro Gyra (148), Astrud Gilberto (154), Marcus Miller (162), and singer Dee Dee Bridgewater (188). Guitar wiz Russell Malone, born in Georgia and now resides in New Jersey and who is best known for his work with Diana Krall, is the most viewed artist on the AAJ site. This surge in the interest comes ahead of Malone’s July 17 release of Live At Jazz Standard Volume Two CD, the continuation of Live At Jazz Standard recorded at the New York City’s Standard on September 9-11, 2005. But, for a seemingly humbled Kathy Brown this interest shown in her by AAJ viewers is way ahead of her own expectations. “I am thrilled”, said an elated but muffled Kathy Brown. “It is nice to know that people are interested in me as a musician. I never expected to be viewed, thinking I would be insignificant among this great line up of jazz artists that are profiled on the jazz website. It might be that viewers are looking on me as a woman but I would like to think that people out there are interested in my talent”, she told the Observer. Continuing, “I am thrilled to know that I am being regarded among jazz greats like Ahmad Jamal, Diana Krall, Marcus Miller, and Quincy Jones. I hope one day I will be able to take my music around the world and maybe then I could be justifiably considered among those greats”. Guitarist maestro Ernest Ranglin and pianist Monty Alexander are the only other Jamaican musicians registered on the AAJ website. 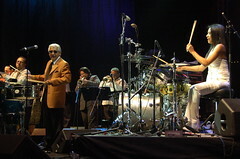 All About Jazz is a site produced by jazz fans for jazz fans and whose mission, according to the website, is to provide information and opinion about jazz from the past, present, and future. It posts profiles and reviews of jazz from around the world, and interviews with international musicians. Quite a few people came up afterwards and said that our collective set was more enjoyable than the music on stage. 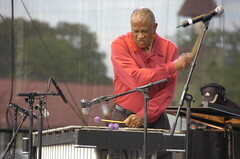 Vibist Bobby Hutcherson ends a song with a flourish during his well received set last Sunday at the Atlanta Jazz fest. My first time catching him live and it was well worth it.